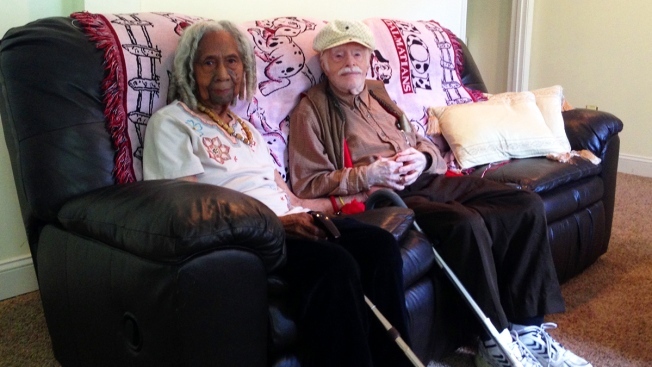 A 95-year-old Virginia newlywed died just weeks after his 96-year-old wife was taken away by family members to Florida. Eddie Harrison died Tuesday in a hospital after suffering from influenza, said Rebecca Wright, who was caring for the couple in their Alexandria, Virginia, home. Harrison became distressed after his wife and longtime companion, 96-year-old Edith Hill, was taken away, Wright said. Wright is Hill's daughter. “He lived for her, and she lived for him. It's the love story of the century,” Wright said, recalling how they would dance, take walks and care for each other. Harrison and Hill's marriage this year after 10 years of companionship was disputed in court. Their wedding was problematic because Hill has been declared legally incapacitated for several years. Another of Hill's daughters, Patricia Barber, contested the marriage, saying it would complicate the eventual distribution of Hill's estate. But Hill and Harrison said they wanted to stay together. A judge appointed a new guardian for Hill to protect her interests, removing Barber and Wright as guardians, but left the marriage intact. The interracial aspect of the marriage also was unique because the two longtime Virginians would not have been allowed to marry if they had met in their 20s, 30s or 40s under state law at the time. On Dec. 6, Hill's guardian arrived to take Hill away to Barber's home in Florida for what was supposed to be a two-week vacation. Police were called to the home during a traumatic 40-minute negotiation to convince Hill to leave, Wright said. When Hill did not return home as planned after two weeks, Harrison began to realize she was not coming back, Wright said. Daisy Birch, a family friend, said Harrison was heartbroken. He also became ill with the flu and checked himself into a hospital. A dispute continues between the two sisters, Barber and Wright, over Hill's affairs and place of residence.